Island Lake -- the Village of Friendly People® -- is getting a new mayor. If it hasn't happened already, Charles Amrich is to be sworn in there, at some future date or other ... it's not exactly known when to your LakeCountyEye. We endorse Amrich, who was mayor for 20 years and will have to use his experience to mend fences and cut through the politics that often clouds Island Lake decision making. He stresses the need for better communications, to listen to residents and answer their questions. We agree that's a good start. Amrich led a ballot slate -- For the People -- one that included village trustee candidate Anthony Sciarrone, who also won. Sciarrone had previously served as Island Lake's Chief of Police. In a burst of candor, the Daily Herald now reports that Sciarrone has been accused of having threatened violence against Island Lake police officers and Village officials. said he heard Sciarrone say someone should put a bullet in trustees' heads. reported hearing Sciarrone threaten to shoot village officials "in the head." Ordinarily your LakeCountyEye does not suggest operatives should admit to their political slate someone who has been accused of making violent threats. But then again, never having actually lived in Island Lake, what does your LakeCountyEye know? Threaten to take them for a ride on the Route 53 Extension. Walk the dog over their medicinal marijuana plot. Promise to share a sample of their DNA with the Lake County State's Attorney Office. 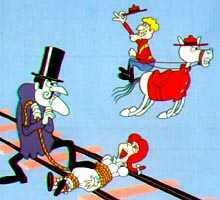 like Snidely Whiplash would do back in the day. like Don Corleone would do back in the day. Call in the Antioch Rescue Squad. Vow to blow the whistle on where they conceal their carry. Rat them out on the LakeCountyEye. Look for your LakeCountyEye strongarming a dumbbell near you.